Pura Tirta Empul is considered as one of the most important temples in Bali because of its sacredness and remarkable beauty. 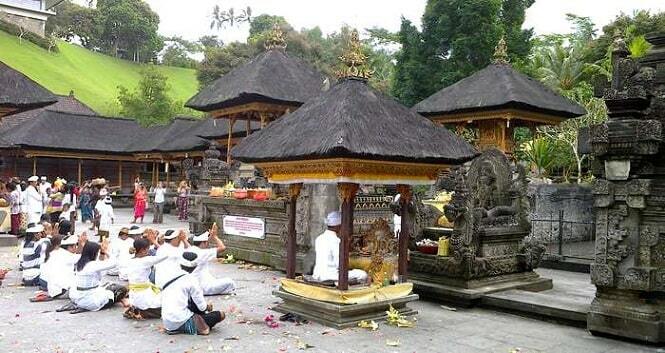 Why Pura Tirta Empul Temple is special ? The myth behind the curative and purifying spring tells of a Balinese ruler, known by the title Mayadenawa, who is depicted to have defied the influence of Hinduism and denied his subjects religious prayers and practices. The legend goes that this eventually angered the gods, and in a campaign, god Indra sought Mayadenawa’s subdual. What to explore at Pura Tirta Empul Temple? Tirtha Empul Temple is an ancient temple in Bali famous for its holy water which is used for spiritual reasons. The temple is over a thousand years old and features a spring which feeds a pond through several spouts. Moreover, the temple itself is a beautiful traditional Balinese architecture with split gate and shrines to Hindu gods, and a big pavilion in the courtyard. Tirta Empul is divided into 3 courtyards. At the first courtyard there is also the pool for public bathing and even tourists can enter the pool. The water source at Tirta Empul is believed to be the source of life and prosperity. How to get to Pura Tirta Empul Temple? Pura Tirta Empul Temple is located in Tampark Siring and in the middle between Ubud and Kintamani, so you can access by local private chartered van or from the airport for 1 hour 30 minute by car. You should bring a sarong and sash, towel, a change of dry clothes and rent a locker in the changing room. Just follow the long line of people in the spring and you will feel so purified and refreshed. Similar to other temples you visit in Bali, you can’t wear shorts or short skirts. If you want to take photos, remember to give some respect to the devotees while they are praying. use your zooming features or lens for the purposes. Please do go near at aim the camera straights in front of them. During their Piodalan ceremony, you will have opportunity to see the whole village descended to the temple, wearing the traditional Baju Adat, carrying various canang and dupa, and praying. You should visit the temple first before you bath because you won't be allowed to go in with wet clothes. The best time to come for a purification ritual is early morning before crowd. You can dip yourself into the holy water pool and there are lockers available to lock your belongings. The temple complex also has a kitchen and dining hall where the devotees could eat. You have to participate in a meditation before entering the cleansing pools. You should visit with a guide - not only for the valuable cultural explanations, but also to avoid paying excessive fees and "donations." If you don’t have cash, there is a ATM station next to the toilet. People also visit neighboring Guning Kawi or the Elephant Cave. Tirta Empul Holy spring water temple is located about 700 meters above sea level, the situation is fantastic, green there are some big trees around that make this place more relax and special, i cant say anything more, I love this place so much, for sure i will go there in other time for bathing also blessing ceremony. Visitors are allowed to take a bath in the pond which has clear water. The unstoppable water flow is believed to be able to cure any kinds of diseases.